Spring might still be several weeks away, but it’s never too early to think about what you’re going to get out of your self-storage unit once warmer weather arrives. 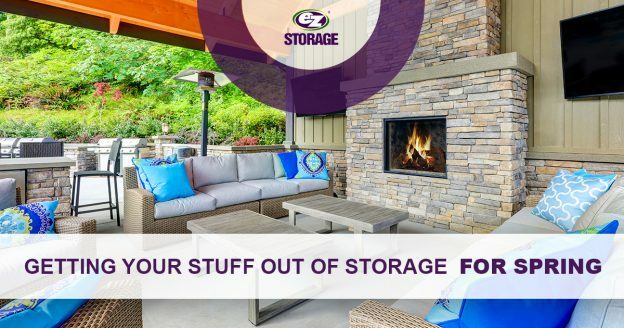 At EZ Storage® in Philadelphia, we love helping people find the right storage solutions, and if you’ve rented a space with us over the winter, then there are likely some things you want to retrieve come springtime! It might not quite be time to sit on the patio, but the days are coming when you can enjoy your evenings and weekends in the backyard. If you have outdoor furniture that you put into storage, then that might be the first thing you get out of the unit. If it was the last thing you deposited last fall, then it will be the closest thing to the door! You’ll want to be sure that everything is clean and stable before you put cushions on it and sit down for the first time. Perhaps you’ve been waiting all winter for spring to return so that you can take a weekend trip to your favorite spot in Pennsylvania. While you may still need a jacket, you’re ready to break out those t-shirts and shorts and enjoy some warm, sunny days. If you have spring and summer clothing in storage, then take those boxes home, sort through everything, and build your wardrobe for the season. Our storage centers in the greater Philadelphia area have room for your recreational vehicles, so if you stored a motorcycle or ATV, the next few weeks could provide an opportunity to get out and ride. You’ve been waiting for months to get back on the road or the trail, and hopefully the weather will cooperate with your plans. Getting your small vehicle out of storage now will give you time to tune it up, clean it, and get it ready for that first nice day of spring. Your storage unit might be filled with a plethora of items, all of them from different parts of the house. While spring cleaning is often focused on the house, it can also be a great time to clean out your storage unit and take various items back home. As you clean the house, you might make room for that piece of furniture that’s been sitting in storage since last year, or you may have a spot on the bookshelf or the wall for that old family portrait that’s been in a box for as long as you can remember. Taking a few boxes out of storage will create more space for other things that you need to store or keep safe for the spring and summer. At EZ Storage®, we’re here to help you have a pleasant self-storage experience. If you’ve rented with us for the past few months, then we thank you for your patronage. If you’re looking for an affordable storage unit, then we hope that you’ll consider using us. All of our spaces are available on a monthly basis, and we offer both standard and climate-controlled units. This entry was posted in Self-Storage Philadelphia and tagged affordable storage, self-storage, self-storage near me, self-storage units, storage near me, storage units on February 1, 2019 by admin.